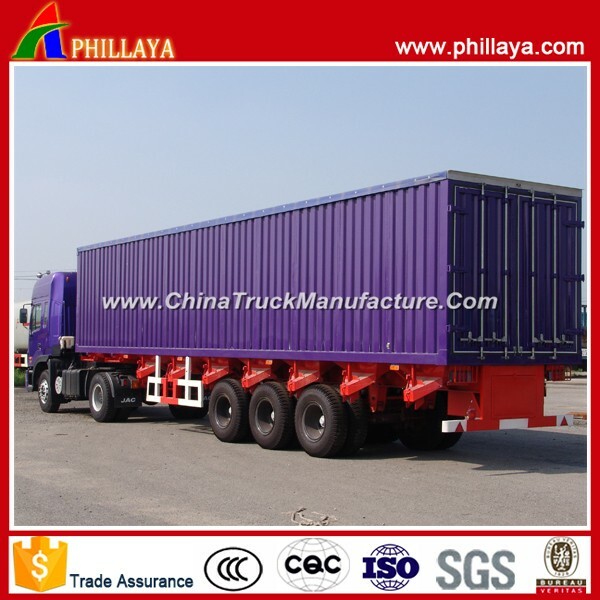 Qingdao Phillaya International Trading Co., Ltd. is a comphensive corporation majored in the Technology R & D, import & Export of kingds of Semi Trailers like container semi trailers, flat bed semi trailers, side wall semi trailers, store house bar semi trailers, van type semi trailers, low bed semi trailers & kinds of tank semi trailers like fuel tank semi trailers, LPG semi trailers, LNG semi trailers, chemical liquid tank semi trailers, bulk cement semi trailers, asphalt tank semi trailer etc. of which tank bodys are made of carbon steel, aluminum alloy, or stainless steel. We have two factories, your enquiry and visiting will always be welcome warmly. Our concept is to promise you better quality at competetive prices with best service all the time. Stringer Height: 500mm, upper plate is 14mm, middle plate is 8mm, down plate is 16mm; Material is Q345 carbon steel (called as manganese steel as well). Usage Applicable to the transportation of the household appliance, textile goods, coal, dinas and other building materials. Other Descriptions Box shell uses the corrugated steel plate (anti-wave) or flat type steel plate with high intensities. The interior part adopts a skeletonless structure, maximizing the carrying capacity. X-shape tension brace fixed the box shell a very strong unit. Other Specifications The top of the box can be close-ended, pull/push open-ended, open-type, or open-type with cloth tent poles. The max height of the rear guard from ground is 550mm, and the cross section is 160mmX40mm. Ø Service - prompt reply, efficient communication by phone/email/app online. There are always perfect solutions to problems that you can come up with.